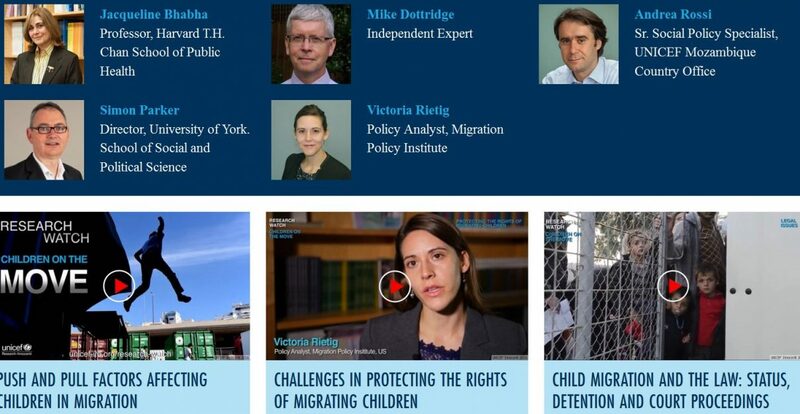 Jacqueline Bhabha is featured in the new edition of Unicef Innocenti research center’s Research Watch, which focuses on Children on the Move, an area of work in which professor Bhabha and her research team are deeply engaged. The new edition highlights the urgent need to develop solid child migration policy based on current, rapidly evolving global realities. It features a series of video interviews with leading experts including Bhabha, Andrea Rossi, Mike Dottridge, Simon Parker and Victoria Rietig. Bhabha is coauthor of Recommended Principles for Children on the Move, a rights-based set of recommendations geared toward policymakers and others working directly with or on behalf of migrating children. In 2014 she published her most recent volume, Child Migration and Human Rights in a Global Age.